Jesus The Radical Pastor: Jesus on "Who's In? Who's Out?" Jesus on "Who's In? Who's Out?" What do a Gucci chainsaw and Jesus have in common? There's a lot of emerging conversation about re-working the whole "who's in? who's out?" construct. I think this is a good aspect of the conversation. Do some think the whole question needs deleting? I think so. Yet, I was jolted into thinking some more about this issue as I encountered Jesus in Mark 3: 31-35. 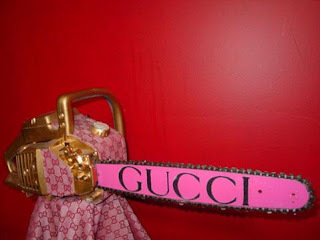 The Gucci chainsaw is not really "in." I got this picture off of "google images." And I'm not convinced it has anything to do with Jesus. I was just amazed that such a thing exists. Maybe it will be purchased by Elton John. Who knows? Jesus was about redefining some long-held, almost irrevocable traditions in his 1st century, Second Temple Judaism culture (as many of you know from reading Tom Wright's The Challenge of Jesus). Jesus dared to redefine "family" in a centuries-long, patriarchal society. Mark makes this crystal clear in Mark 3: 31-35. It is worth reading...verse at a time. 31 Then Jesus' mother and brothers arrived. Standing outside, they sent someone in to call him. 32 A crowd was sitting around him, and they told him, "Your mother and brothers are outside looking for you." 33 "Who are my mother and my brothers?" he asked. 34 Then he looked at those seated in a circle around him and said, "Here are my mother and my brothers! 35 Whoever does God's will is my brother and sister and mother." Why were his family looking for him? Mark 3:21 reports that they wanted to "seize" or "take custody" of him because they said, "He is out of his mind." This not a flattering picture of Mary and Jesus' brothers. They wanted to stop what they thought was an obsessed son and brother. Jesus was looney tunes. After the classic Markan "interruption" to build the story (of the deep misunderstandings about Jesus), we pick up on the family's arrival in verse 31. For me, Mark 3:34 is a case study in centered-set thinking. Mark writes that Jesus looked around (περιβλεψαμενος). This is a deliberate 360 degree gaze. How do we know? Because Mark adds that the crowd was "in a circle" (κυκλω) around him. This detail is important. Who is in the center? Bingo. Those on the "outside" were natural family--"your mothers and your your brothers." Jesus takes the opportunity to redefine family as those inside who are accepting of and attentive to him and his word. Being accepting of Jesus and attentive to his word are those "who do the will of God" (verse 35). Did you hear the grenade explode? This is radical, scandalous talk! Why? No longer is Abraham's blood in the veins a family identity marker. No longer is Jewish circumcision an identity marker. No longer is eating Moses' menu an identity marker. No longer is being a Jewish man the identity marker. "Whoever does the will of God is my family," Jesus declares. This opens the door to women, Gentiles, Samaritans, the poor, lepers, outcasts, "people of the land," slaves, whoever! The old stand-by markers are old wineskins exploding as the new wine of Jesus' Way is poured into human lives and relationships. Centered set. You could be a diligent Jerusalem scribe in the lineage of Abraham and be guilty of the sin that is never forgiven (verse 29). You could be a marginalized, needy Samaritan woman who is a true worshipper of the Father in spirit and in truth. It depends on your response to the Center, the one in the middle of the circle. There are those who are "in" according to Jesus. And those who are "out." Jesus will later say, "The secret of the kingdom of God has been given to you. But to those on the outside everything is said in parables..." (Mark 4:11). Those on the outside (δε τοις εξω). Those on the outside seem to be those wanting to ignore, defame, detract from, even destroy Jesus. They are neither accepting of nor attentive to Jesus and his word. The emerging conversation cannot shake the need to discuss "who's in? who's out?" Go to www.choosejesusrightnow.com & click on BUMPER STICKERS. Thanks for this post. It touches slightly on something that I've been thinking lately and brings a new perspective to it. I appreciate that. Thanks for the link. Great. I am fascinated by the creativity and courage of Jesus. He's the master of "the teachable moment." as one who works with/for youth - the "teachable moment" and the radical and yet down to earth message is something I want to both emulate and pass on to youth... May God use His church to re-learn and unashamedly pass on the Kingdom Message of Jesus and may we see a group of ordinary radicals emerge. The thing I've noticed about what Wright has to say is that when he says it, we understand how revolutionary it is. When we try to repeat it we come up looking like we are saying the same thing people have said for centuries...wrongly. I'm having a terrible time getting across how clear a picture, and diffent, we get when we understand the cultural context. I agree with you. We have so mutated 'repentance' into mushy spiritual piety that when we realize so much has to change in our thinking---our ways of packaging and living the Christian faith---that it is staggering both to grasp and to communicate. And the will of the Father is to love. Jesus summed it as, God and neighbour. How much we are willing to give, and how much we are willing to accept.The more this gravitational pull of this will draws into the center...the more we find Jesus. Well said, my friend. I heartily agree. thanks for stopping by Pastor John... come by any old time - I would love your input! Thank you for this post, it clarifies some things with me. It is interesting that Jesus used the moment and didn't worry about offending his mother and brothers. You're right. It seems Jesus knew the importance of his mission, and offending others was not a huge concern for him. Is it a fair treatment of this text to say that Jesus was teacing the pre-eminence of praxis? In other words, if this was a classic "teachable moment" was Jesus primary objective redefining the family of God as the God-praxis family? The family of God is now the people who act like Jesus. Or have I totally missed the point here? I'm not sure I understand what you mean by "God-praxis." However, I think that your definition of the new family as those who act like Jesus is on target. I appreciate the answer and the original post. This is a challenge for me, since my education in the Church has said the same exact thing, but came to a different conclusion. The Church has long taught me Center set thinking, or to be "Christ-centered," but that has always been in terms of orthodoxy. "Make Jesus the center of your life" and "Make Jesus the lord of your heart" have been slogans that (somehow) have taught me to agree with Jesus, instead of follow him. Or, do I believe in a list of things about Jesus (his deity, his virgin birth his resurrection, etc.). So, the "who's in who's out?" question was answered in terms of orthodoxy. All that brings me to the qustion: does orthodoxy still play the same role as I was taught or is it in reality subservient to orthopraxis? I believe that orthopraxy is the standard for God's evaluation of our lives at the judgment--not orthodoxy. Many may say correct doctrinal things to Jesus, but still be separated out from the sheep (Matthew 25). How do we treat those who are marginalized in our society, our world? Our *actions* will be under review, not our beliefs. Ukraine Ponderings on "Cheap Grace"